Last summer I went to WebVisions here in Portland. While I missed this years event, I’ve been to other smaller scale events such as BarCamp. They’ve all been similar in that there are a number of sessions going on at once that are mostly unrelated. That was one of my gripes about WebVisions. 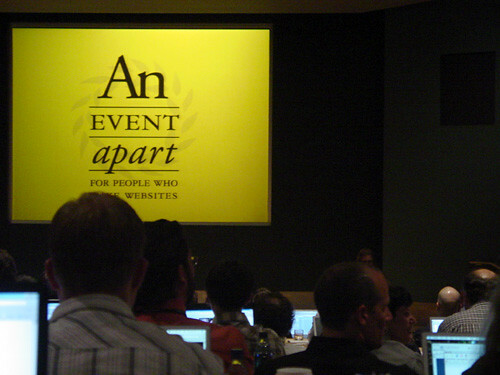 I recently attended An Event Apart Seattle. While it’s still a bunch of nerds hanging out at a conference center, it’s different in that it feels more like a two day, tag team lecture – a notebook of presentation slides is even included. There’s one room. One session. One speaker at a time. Topics feel somewhat paired and ordered. Some speakers talk both days. In a word, it’s cohesive.